How many folks have a original iPad and think, “if I only had a camera on this iPad!”. Now, Disney, with the help of Sakar, has an answer for you. The two companies have come together to offer a 7.1 MP digital camera that has a iPad connector on it. Simple snap photos with the camera, connect it up to your original iPad and import the photos. The camera works well with a free Disney app to do minor editing too. Two particulars on the camera is that it is low on internal memory but accepts micro SD cards… and it only has a 1.5 inch screen on the back. 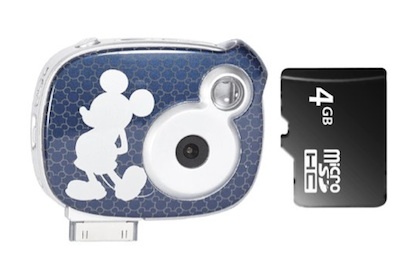 Of course, it comes with a Mickey or Mini Mouse picture on them so the options might not be the best professional solution. Kids love it and adults can use the Sakar Disney camera too. The camera will actually work while connected to the iPad too, but that makes a pretty big overall package to manage.